Welcome back to another installment of Playmat Finance, where we discuss the MTG-finance implications of that rubbery fabric that stands between our precious cards and and the harsh surfaces where we sometimes play. The first part of the series took a shot at crafting a rudimentary framework to pin a value on Grand Prix playmats, which are part and parcel of modern-day Magic Grands Prix. 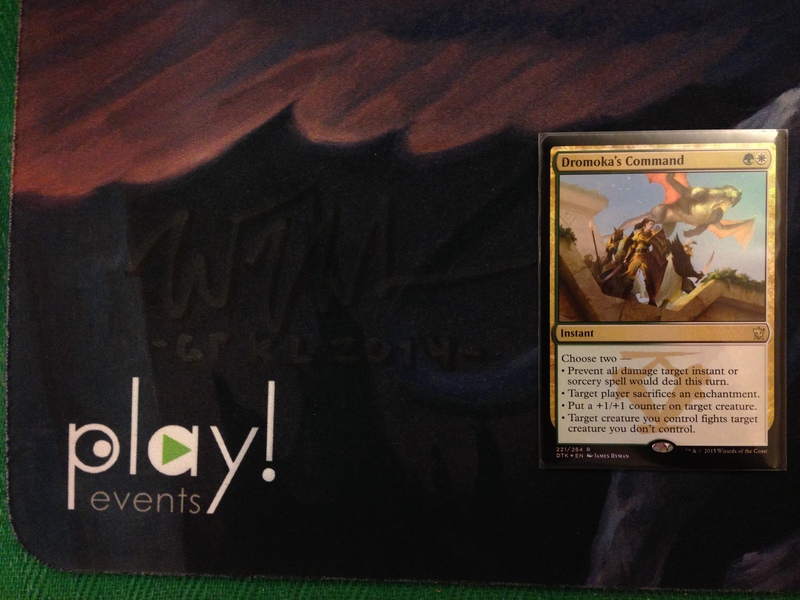 Part two took a look at Game Day playmats and Grand Prix special or side event playmats. Part three discussed the issue of counterfeit mats and their impact on the value of authentic, sought-after mats. 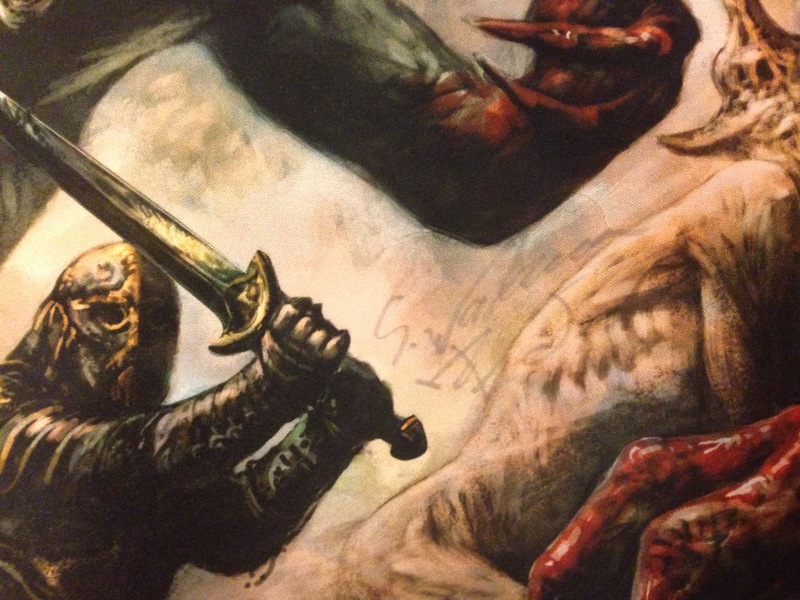 Today’s article will go over the best practices for preserving the value of your playmat, but not in the manipulate-the-market-by-buying-out-every-other-copy-of-your-rare-playmat sense. A number of readers mentioned in the comments on the first Playmat Finance article that they would be interested to learn about playmat care. I’ve always thought that my assiduous TLC for my playmats was a bit of an outlier, seeing that most players I know just chuck their playmats in their bags after they are done with them. I know a few who fold theirs. What a sacrilege. The amount of interest in playmat care is a small testimony to the playmat’s growing status as a valuable and collectible piece of Magic paraphernalia. Magic has long transcended its status as merely a card game, establishing its own terminology and culture, or as some would even describe it, a lifestyle. It took a while for playmats to breach into the mainstream. The first Game Day playmat didn’t exist until Dark Ascension Game Day in 2012, but it has been a mainstay of Game Day prizes since then, with some of them garnering a good amount of value. After 21 years of the game’s existence, TLC for Magic cards is about as fundamental as the stack. Sleeves are essential for competitive play (the last time someone played without sleeves at a Grand Prix was Valentin Mackl at Grand Prix Vienna 2013, and that was done on purpose). Double-sleeving your Standard decks is no longer considered odd. Heck, I even triple-sleeve these days (I’m experimenting with ways to keep the cards I play with in Marcel mint condition). If you want to go all the way, you can even do this, which is technically legal if you can shuffle them without assistance. Resources on playmat TLC are surprisingly sparse on the internet. Googling “playmat care” returns results like this gem. “Treat your playmat like you would any rug or carpet.” I don’t think I’m going to do that. So far, the best resource for playmat care (and an introduction to playmats for the uninitiated and unconvinced) I’ve stumbled upon is a short video by no other than The Professor from Tolarian Community College. Whatever knowledge I have regarding playmat TLC were picked up over the years. While most of my points do overlap with The Professor’s—there are only so many ways to treat your playmat right—there are a few pointers from my own experience I would like to add, which we will get to in a bit. I got my first playmat, the Dark Ascension Game Day playmat—which I won because my opponent in the top eight scooped in game three after an hour of a Blue-Black Control mirror as he had a dinner appointment to catch. I did not treat that little piece of history (first Game Day mat ever!) right. While I did not fold it, I just rolled it up and stuffed it into what little free space my Magic bag could afford. Folding your playmat is the surest way to ruin your mat, as The Professor explains in this segment of the video. Rolling your mat is the correct way to keep it. I am not sure if rolling it with the rubber bottom facing outwards or with the fabric layer facing outwards is the right way to roll it. I used to roll it with the rubber bottom facing out to protect the fabric layer from damage, but I was advised by a friend that rolling it with the fabric layer outwards better preserves the rubber bottom. Annoyingly, I could not verify the legitimacy of that advice. Anyway I now roll it with the fabric layer facing outwards as I keep my playmats in tubes these days. Surprisingly, the borders have yet to show wear and tear. 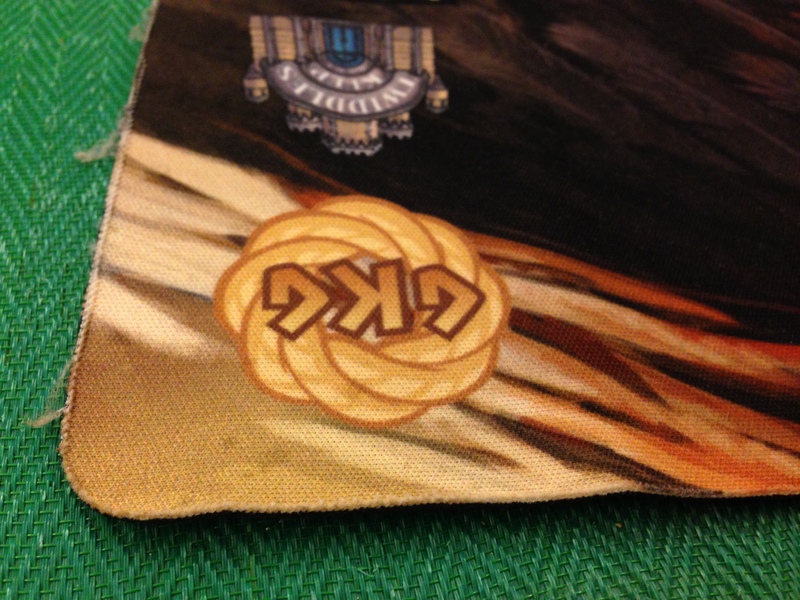 But it is quite obvious that the playmat is a little creasy on the edges. I suspect it is probably because the mat frequently shared the same space in my Magic bag with my deckboxes and the occasional tumbler I carry along, which inadvertently crushed the mat as I toted around the bag. Even though you can still play with them, dealing with worn-out corners is not ideal for collectible playmats, playmats with a moderate to high value, or playmats with sentimental value. 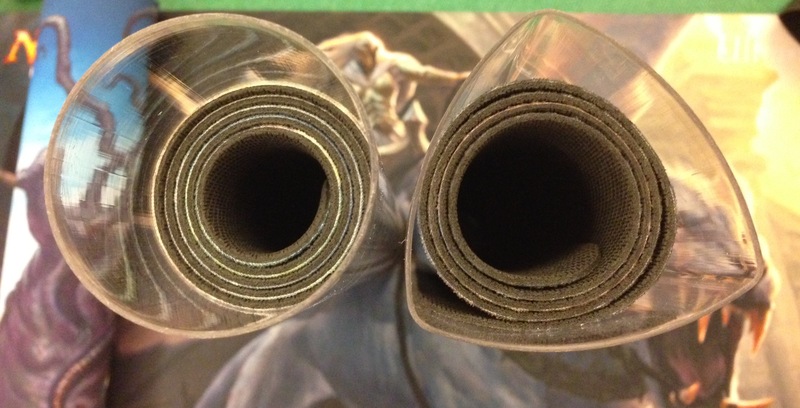 To combat this, I would highly recommend getting a playmat tube, regardless of whether your playmat is a collectible or it just serves as a velvety surface for your precious cards. It only costs a few bucks, and besides keeping your playmat in good condition, it makes transporting your playmat so much tidier. 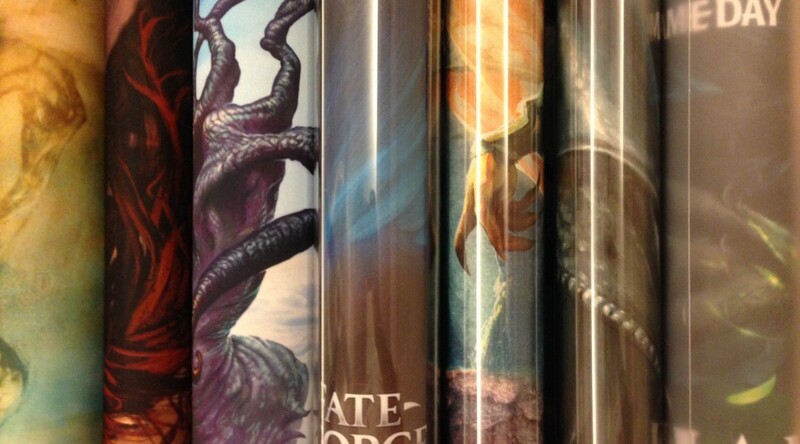 There are a good variety of playmat tubes out there, but the two popular ones seem to be the Ultra Pro tube and Monster tube. Like The Professor, I too prefer the Monster tube, but not just because it does not roll off the table. Monster tubes have a larger opening, partly facilitated by its prism design. I’ve found it a lot easier to fit a mat in a Monster tube compared with an Ultra Pro tube, which I sometimes need to re-roll a mat multiple times to get it to fit and it could get frustrating after a few attempts. They are both around the same price. A playmat serves to protect your card from dirty surfaces, but is itself susceptible to dirt. A dirty playmat increases the chance of dirt getting trapped on your sleeves. I’ve always thought that playmats and water do not go well together, so my preferred method of cleaning is wiping my playmat with a damp cloth, on both the top and bottom of the mat. It’s imperative to clean the bottom of your playmat, as it can get quite dirty, and the dirt will rub onto the fabric surface when you roll your playmat. A wipe or two with a damp cloth usually removes the residual dirt that accrues from using the playmat. I usually leave it hanging for a few hours to make sure that both sides are completely dry. When I watched The Professor’s video above, I was surprised to find out that some playmats can go in the washing machine. The thought of having my playmats go through the rough and tumble of a washing machine cycle sends shivers down my spine, but it seems that Ultra Pro and Inked playmats are made to be machine washable. Inked Playmats‘s FAQ recommends using the delicate/handwash setting if you’re washing them in a washing machine. Don’t use the dryer—leave your playmats out to air dry. I have yet to give this practice a try, as my mats seem to be doing quite well with damp cloth cleaning. The worst ordeal I’ve had with my playmats was spilling a cup of pumpkin spice latte on my Grand Prix London 2013 playmat (the perils of playtesting at Starbucks). I rinsed the affected part with tap water, left it to dry, and there wasn’t any trace or scent of that beverage on it after that. I guess it’s nice to know that you could chuck your Ultra Pro or Inked playmat in a washing machine if you couldn’t be bothered to wipe them. If your playmat is not from those manufacturers, it would be prudent to check with your playmat manufacturer if the playmat is machine washable prior to doing so. 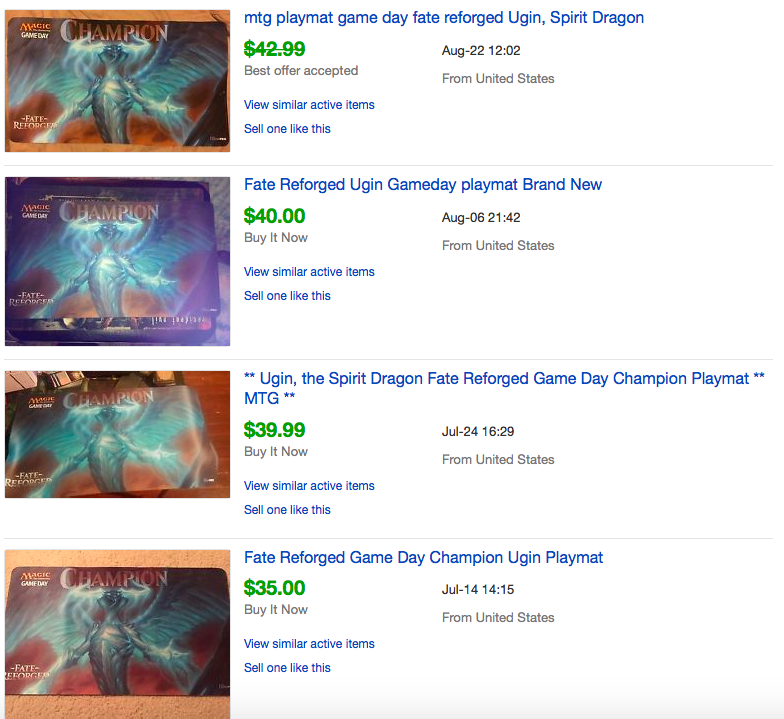 I may try it one day with one of my worn out mats, but I certainly won’t be tossing my Ugin Game Day one into a washing machine. I even avoided the signature area when I cleaned the mat. I doubt I’ll be getting any mats I plan to use signed in the future. Even brighter playmat backgrounds do not make signatures look any better or last any longer. The last playmat I got signed was a Grand Prix special by Peter Mohrbacher, but that playmat is intended for my collection rather than use, so I’m hoping the signature will last. I hope I have covered enough about playmat care to give you insight on keeping your playmat in tip-top condition for as long as possible. Do share any other tips or experiences you have regarding playmat TLC in the comments segment below, or catch me on Twitter at @theguoheng. Useful article, thanks a bunch! I personally do not roll my mats — I fold them and put them on top of my cards in my backpack, so there’s typically no weight pressing on them. 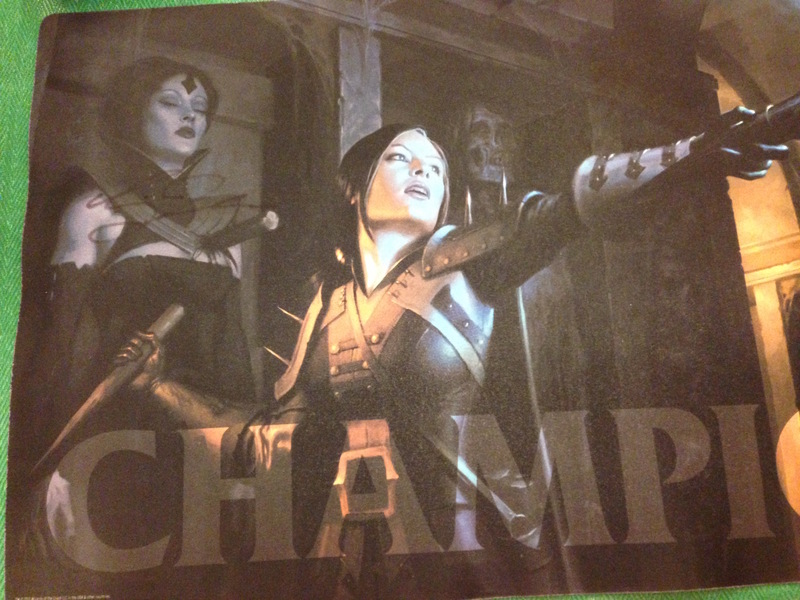 My mats are all Gameday Champion mats, and there are really no signs of wear and tear so far (currently using my Return to Ravnica champion mat, and the edges are a bit worn but not nearly as much as your GP London playmat above). The back of the mat is still as good as the day I got it in 2012, though I haven’t used it all of that time.